While Scott struggles to find his place as an Alpha, he, Allison and Stiles begin to experience strange side effects as a result of re-igniting the power within Beacon Hills. They soon discover that the answer to their problems may be found in a new student named Kira, a girl with remarkable powers of her own. The series is a co-production with, and distributed by, MGM, in adssociation with Los Marbles Productions, Inc., First Cause, Inc. and DiGa. Following the Pack: The Fans of Teen Wolf – Over 8 minutes of special footage for the diehard, Teen Wolf Fan directly from the Supernatural Fan Expo with cast interviews, exclusive party coverage and more! As an added incentive, consumers who purchase the Season 3 Part 2 DVD will enjoy a gift with purchase Fan Art Collection booklet, which includes 19 illustrious, fan-produced art pieces inspired by Teen Wolf characters and Season 3 Part 2 events. This booklet is available for a limited time only and includes a Forward by Creator and Executer, Producer, Jeff Davis. “Teen Wolf” was developed by Jeff Davis (creator, “Criminal Minds”) who also serves as executive producer. Additional executive producers include Russell Mulcahy (“Highlander,” “Resident Evil: Extinction”), Marty Adelstein (“Prison Break”), René Echevarria (“Medium,” “Castle”), Tony DiSanto and Liz Gateley. The pilot was written by Jeff Davis and Jeph Loeb & Matthew Weisman and directed by Russell Mulcahy. 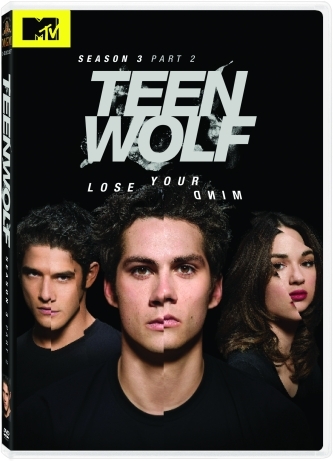 The “Teen Wolf” series is based on a Screenplay by Jeph Loeb & Matthew Weisman. Mina LeFevre, Julie Schwachenwald, Dana Gotlieb-Carter and Alexandra James are the MTV executives in charge of production. The series is a co-production with, and distributed by, MGM, in association with Lost Marbles Productions, Inc., First Cause, Inc. and DiGa.